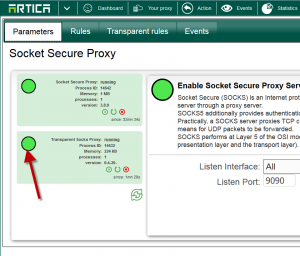 Socks transparent rules is a strong feature that allow the proxy ( act as gateway ) to catch specific destinations ports in order to transparently forward TCP connections to the Socks Proxy service. 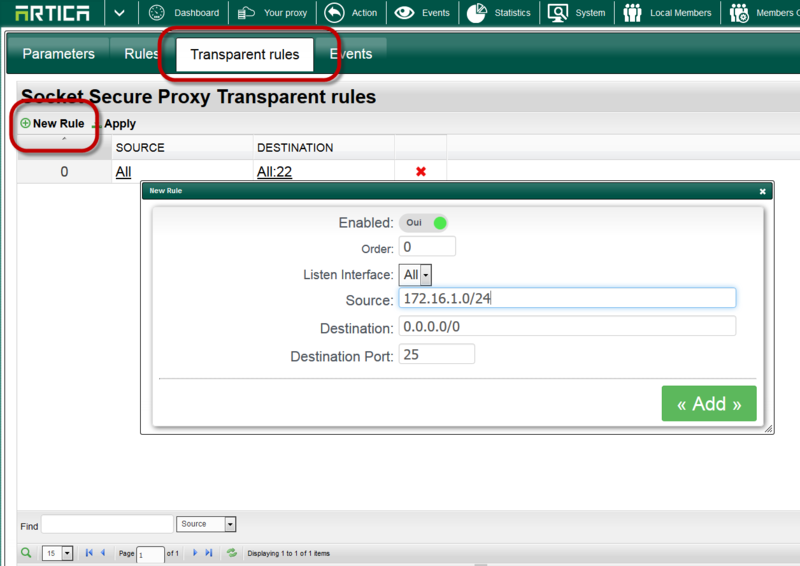 Select the “Transparent rules” tab. You can define rules using source IP addresses/ net mask in CDIR mode, destination IP addresses/ net mask in CDIR and a port. The address 0.0.0.0/0 means all addresses. In the example, we transparently forward TCP connections to the socks proxy server when packets are from the 172.16.1.0/24 network and for the 25 port. You must click on “Apply” to make rules in production mode. On the main parameters the “Transparent Socks Proxy” status must show a running service.